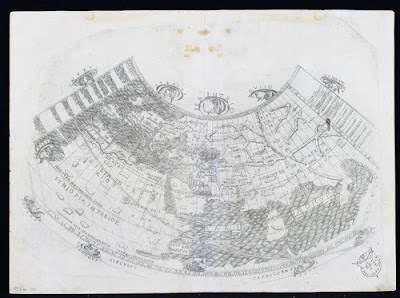 A copy of the extremely scarce and considered unobtainable 1477 Bologna printing of Ptolemy’s world map fetched a record price of 210,000 Euros ($312,000) plus premium at Reiss & Sohn auctions in Konigstein, Germany last week. The map shows the whole hitherto known part of the world and is the first copperplate engraved map of the world. Its estimated price was 25,000 Euros. The map is from the 1477 first printed edition of the Ptolemy Geographia with maps (and the first printed book to employ copperplate engravings) and the rarest of the incunabula atlases. Only twenty-six copies from the original printing of five hundred have been traced. Of all the early Ptolemy geographies, the Bologna edition was the only one never to be reprinted or reissued. This, the first printed atlas of the world, was hastily prepared in 1477 in Bologna, Italy. The maps are thought to have been engraved by famed manuscript illuminator Taddeo Crivelli, who had learned this art only a few years earlier. 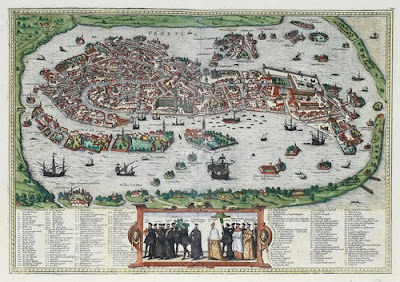 Being inexperienced as an engraver, Crivelli made several errors in the map, including spelling mistakes. Crude line work, and letters and words in mirror (such as the name of the wind Vulturnus) make this Renaissance print all the more fascinating. For some unknown reason the original map's frame was cut off at both sides of the Equator. Later in its printing history corrections and minor alterations were made, and the original blank sea areas were decorated with billowing lines. This copy of the map was, evidently, excised from the atlas at a very early date. 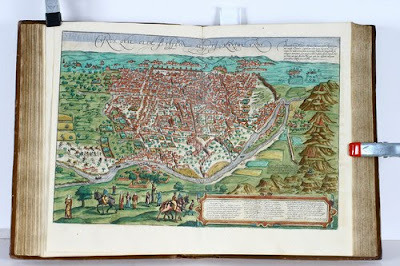 The highest price at the Reiss & Sohn sale was achieved for a hand-colored copy of the French edition of Braun & Hogenberg's Civitates orbis terrarum which sold for 230,000 Euros ($342.000) plus premium. 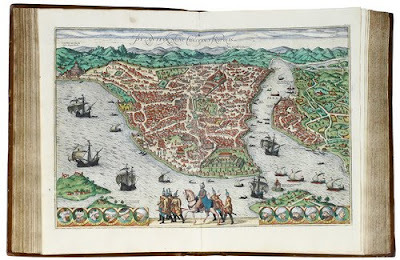 This great city atlas, the most famous of all town books, edited by Georg Braun and largely engraved by Franz Hogenberg, eventually contained 546 prospects, bird-eye views and map views of cities from all over the world. Braun (1541-1622), a cleric of Cologne, was the principal editor of the work, and was greatly assisted in his project by the close, and continued interest of Abraham Ortelius, whose Theatrum Orbis Terrarum of 1570 was, as a systematic and comprehensive collection of maps of uniform style, the first true atlas. The Civitates was, indeed, intended as a companion to the Theatrum, as indicated by the similarity in the titles and by contemporary references regarding the complementary nature of two works. Nevertheless, the Civitates proved to be more popular in approach, no doubt because the novelty of a collection of city plans and views represented a more hazardous commercial undertaking than a world atlas, for which there had been a number of successful precedents. Ptolemaeus, Claudius. Geographia. Bologna: Dominicus Lapis, 23 June 1462 . Braun, Georg. Théâtre des Cités du Monde. N.p., n.d. [Bruxelles 1574, volume one]. Will the Real N.R. De Mexico Please Stand Up? When Did Walt Disney Write A Christmas Carol?